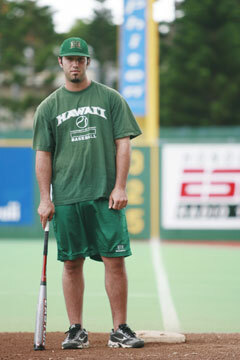 Hawaii first baseman Kris Sanchez went 7-for-11 in each of the Rainbows' first two series this season. Make it two in a row for Kris Sanchez. When: Today, 6:35 p.m., Tomorrow, 1:05 p.m., Sunday 1:05 p.m. 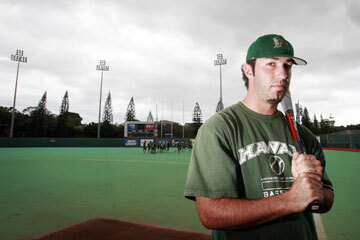 The University of Hawaii first baseman has been the model of positive consistency for the 4-2 Rainbows in the early going this season. He earned his second straight Western Athletic Conference Hitter of the Week award after going 7-for-11 at the plate against Georgia Southern last weekend. Those digits matched Sanchez's production against Santa Clara for a ridiculous .636 batting average and 1.000 slugging percentage to start the year. If he keeps it up, his teammates might start calling him "7-11." Sanchez, of Tucson, Ariz., realized he'd have to shoulder much of the team's leadership load this season in the wake of vocal departed seniors Matt Inouye and Esteban Lopez. "I'm trying to make sure everything goes smoothly this year as a senior, and hitting in the middle of the lineup I definitely have to be more vocal and kind of set an example for the younger guys," Sanchez said. They'd do well to pay attention to him now, because once he's finished school and baseball, Sanchez is considering being an FBI agent. "I have a connection at the FBI headquarters in Phoenix, so that might be something I'm looking at," he said. "Just growing up as a kid, watching movies about FBI agents and just kind of knowing the government has so many secrets, I'm kind of a curious person, so I wanted to know what's going on behind the scenes," he said with a chuckle. If that doesn't work out, Sanchez is hoping for something stock-market-related with the finance degree he is working toward. Kris Sanchez put in extra time in the batting cage and weight room this offseason. Faster than you can say "Freeze, FBI!" Sanchez's stock has risen from reserve to go-to player while hitting in the 5 spot. But Coach Mike Trapasso said it's still too early in the season to "anoint anyone good or bad." "We're obviously happy for Kris and happy for us that he's gotten off to such a good start," Trapasso continued. "For him to go 7-for-11 two weekends in a row, I think has been really key for him confidence-wise." That was a big question for the Central Arizona College transfer coming into his second season with the Rainbows. Sanchez lost his starter job last year when he went out with a hamstring injury to open the season. Luis Avila replaced him at first base over a one-month span and kept the job even after Sanchez was healthy -- Trapasso deemed him to have lost much of the plate aggressiveness that made him effective. Still, he posted a .304 average as a reserve in WAC play to justify his starting role going into this season. Sanchez conceded it was a hard situation to bounce back from. But the 6-foot-3, 220-pound corner infielder "basically lived" in the batting cage and weight room over the summer, and silenced any doubt by posting a team-leading 10 RBIs to this point. That included a 4-for-4 performance against the Eagles on Saturday with two doubles and a triple. "I think you're seeing some maturity and toughness out of a young man that's gone through a lot," Trapasso said. "(He) really faced some adversity and had to deal with that. "And the end result, we're seeing that it made him better." As good as Sanchez has been, he can't be expected to put up video-game-caliber numbers forever. Trapasso pointed out that the Rainbows' bottom of the order has struggled, but wouldn't be written off because of a few bad games. More than piling up individual hardware, it will please Sanchez to have a return trip to the NCAA Regionals. "This year I'm looking forward to contributing more and hopefully getting us back there," he said.